Low graphics|Help What is it? An ancient Indian philosophy to which helps you to control your body and mind. Yoga can be done by people of all ages. It is more popular with women than men but it is becoming more popular with men by the year. 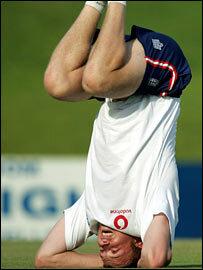 The England cricket team incorporate yoga in their individual training programmes. Yes, there are special classes for children. People forget that kids today are under a lot of stress with school work, the pressure to compete with other children and even parents so some children are turning to Yoga to help them relax. It helps them to develop better body awareness, self-control, flexibility and coordination. It can also help them become better with their daily routines. Yoga helps you to improve and focus the alignment of your body. It can also develop the co-ordination of your breathing and movement as well as teaching you how to hold your posture and flow from one posture to another. Are there lots different types of yoga? Yes, there are many styles - but basically they all have the same aim. The founders of the three major styles - Astanga, Iyengar and Viniyoga - were all students at the Yoga Institute at the Mysore Palace in India. Two other common styles are called Integral and Sivananda. If you fancy taking up yoga, try a few of the different styles and see which one you prefer. What are the different postures? There are too many to go through them all but the basic sitting easy position is called Sukhasana. This is a starting position that helps focus awareness on breathing and the body. It also helps strengthen the lower back and open the groin and hips. Another well known position is the Warrior. This strengthens your legs and your arms.